I've heard from a number of vendors this week who are excited about their participation in next week's Appetite for Awareness and Gluten-Free Cooking Spree, to be held on September 30. "Main event" tickets are still available through the National Foundation for Celiac Awareness and are $100 for adults and $35 for students, and may be tax-deductible. If last year's event was any indication, the opportunity to sample food from some of the area best restaurants and get lots of product samples and coupons is worth the price of admission. If you spot me there (my picture is posted in the "About Me" section of Gluten Free Philly), feel free to introduce yourself. After I wrote about the ready-to-eat gluten-free meals from GoPicnic on Monday, reader Dina wrote to tell me that the company is running a 20%-off promotion for orders placed through its website. Just type KIWI in the coupon code box at checkout. The offer runs through October 31. On Wednesday, I profiled Sweet Christine's Bakery in Kennett Square, Pennsylvania, which sells gluten-free breads and sweets exclusively. Morton's Steakhouse, with locations in Philadelphia and King of Prussia, Pennsylvania and Atlantic City, New Jersey, has gluten-free options on its menu. The Melting Pot is set to open its Warrington, Pennsylvania location (uprooted from Chestnut Hill) on September 30. Since Mr. Ritt's Bakery moved out of town a couple years ago, there's been no dedicated gluten-free bakery in Philadelphia. That's about to change with the arrival of Sweet Freedom Bakery. The bakery, owned by Allison Lupert and Heather Esposito, is coming to Center City (1424 South Street) in November. 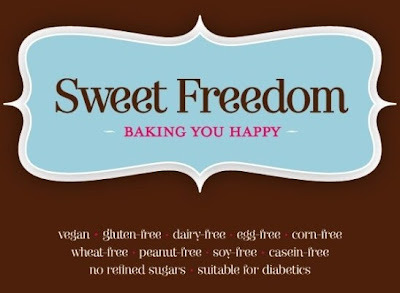 Sweet Freedom's products, which will include cakes, cookies, loaves, muffins, brownies, blondies and pizzelle, will also be allergen-friendly, vegan and contain no refined sugars. There's also some new-product news this week. Nature's Path has introduced two more gluten-free cold cereals. Both Crunchy Maple Sunrise and Crunchy Vanilla Sunrise are made from organic grains such as corn, brown rice, quinoa, buckwheat and amaranth. More Canadian baking: Kinnikinnick Foods announced this week the introduction of several new items, which are currently, or will soon be, available for online ordering at the company's website. New are chocolate and graham-style KinniKritters animal crackers and panko-style breadcrumbs. The products will be available in stores in next several months. 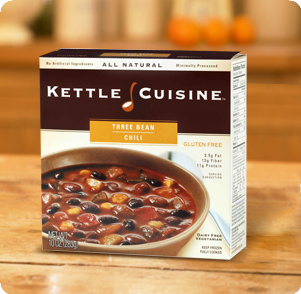 Kettle Cuisine, which makes frozen, ready-to-eat soups, has added several new products to its existing gluten-free line. The company has rolled out a vegetarian Three Bean Chili as well as Organic Carrot & Coriander Soup, Organic Chick Pea with Spinach Soup, Organic Roasted Eggplant & Tomato Soup and Organic Cream of Mushroom & Potato Soup. All of the products come in 10-oz. microwaveable bowls and sell for a suggested retail price of $3.99 each. There are many gluten-free-friendly restaurants participating in some upcoming local Restaurant Week programs. Diners can enjoy a three-course meal from October 5-12 during Delaware Dines Out for only $30 per person. Among the restaurants involved are Iron Hill Brewery in Newark and Wilmington, The Melting Pot in Wilmington and Newark's Soffritto Italian Grill. The South Jersey Restaurant Week runs from October 18-23 and features a four-course meal for either $25 or $35 per person, depending on the eatery. Andreotti's Viennese Cafe in Cherry Hill, Blackbird in Collingswood, Mullica Hill's blueplate, Casona of Collingswood and La Campagne in Cherry Hill will be offering special menus during this promotion. Links to the websites of these restaurants are posted on the Gluten Free Philly restaurant page. Gluten-Free Philly bakery! Thank you so much for lettting me know about this. I'm also lactose intolerant, so I'm especially happy that it is dairy free. Does Sweet Freedom have a website? We do, www.sweetfreedombakery.com--we are working on the content so right now it's just a splash page. We also have a page on Facebook if you are on there (sweet freedom bakery) where you can keep up with what's going on with the bakery.